In 1991, photographer Peter Lindbergh shot the elite eight of the world’s sexiest Supermodels in Brooklyn, NY for the September 1991 issue of American Vogue– Cindy Crawford, Tatjana Patitz, Helena Christensen, Linda Evangelista, Claudia Schiffer, Naomi Campbell, Karen Mulder, and Stephanie Seymour. The shoot titled “Wild at Heart” was styled by Grace Coddington, featuring looks that were a hi-lo mix of Chanel meets Schott– and we in the fashion world have never been the same since. 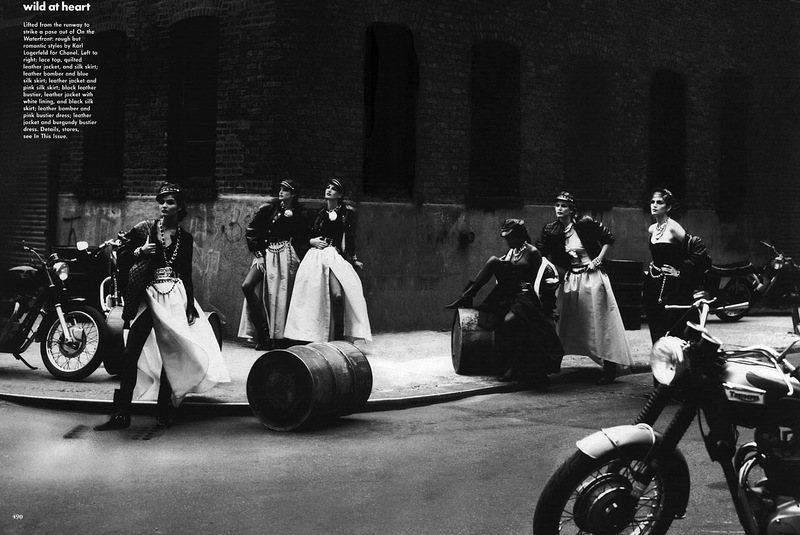 This iconic editorial spread continues to inspire and awe to this day. The 1990s was the decade of the Supermodel– Cindy Crawford, Tatjana Patitz, Helena Christensen, Linda Evangelista, Claudia Schiffer, Naomi Campbell, Karen Mulder, and Stephanie Seymour. This shot was titled “The Wild Ones” with the original selling at an auction years ago for close to $35,000. 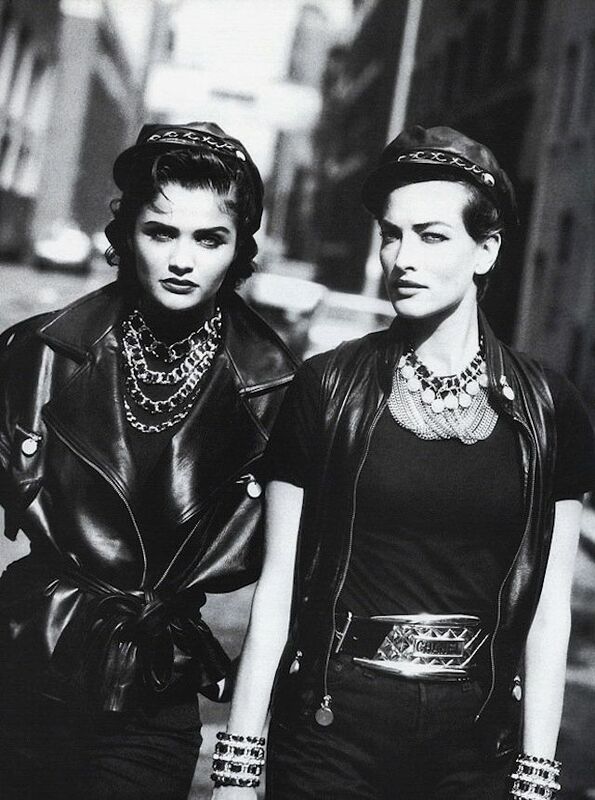 Supermodel Helena Christensen channeling “The Wild One” and striking a very Marlon Brando-esque pose in her Erez leather jacket and Harley-Davidson leather biker cap. Wild at Heart– Lifted from the runway to strike a pose out of On the Waterfront: rough but romantic styles by Karl Lagerfeld for Chanel. 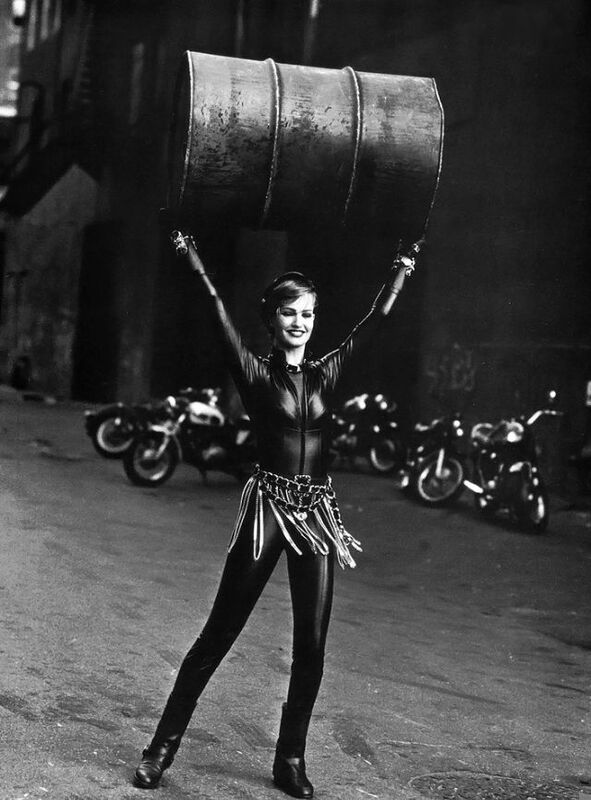 Wild at Heart– being a supermodel is heavy lifting! Wild at Heart– Supermodel Naomi Campbell trenched in Ralph Lauren, dripping in Chanel jewelry. Wild at Heart– Claudia Schiffer in Norma Kamali, necklaces and belt by Chanel, dollar sign necklace by Union. Wild at Heart– Supermodel Cindy Crawford showing one of the sexiest ways to wear leather– over bare skin. Wild at Heart– Supermodel Naomi Campbell in Isaac Mizrahi / Chanel boots, bracelets, choker, and belt / Harley-Davidson leather biker cap. Wild at Heart– Supermodel Stephanie Seymour smoldering in a Mario Valentino leather jacket and Harley-Davidson leather biker cap.